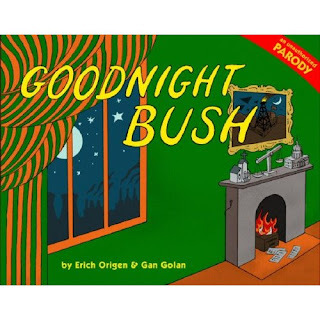 The popular children's book Goodnight Moon has been morphed into a parody of the disastrous Bush regime. Happily, this presidential reign of terror and bumbling will soon be banished into history. Here's hoping it continues to be a source of such wide and deep ridicule in popular culture, so that we never forget its abundant negative lessons. I'm afraid this is not the case. The next president will follow orders from the corporate elite, NWO masters, also. Do your homework. Who is Obama's strategist? Brezinski, come on. There is no real change in these candidates, only more tyranny. Have you been following the Bilderberg meeting in Chantilly, VA this weekend? They will choose the VP for Obama and set policy for the rest of us. No media outlet dares to report on it. So sad. I think you've been overdosing on conspiracy theories, Kathy. I also think it's actually Michelle Obama that will be having the most say about who her husband chooses as his running mate.